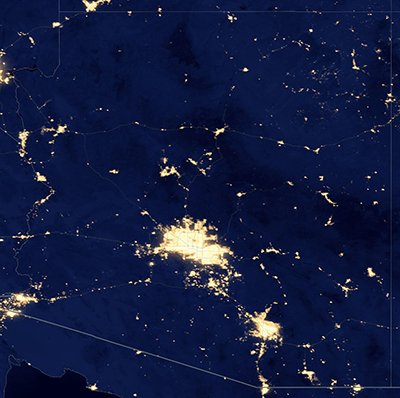 Light wasted upward into the night sky clearly outlines Arizona cities, towns and highways. 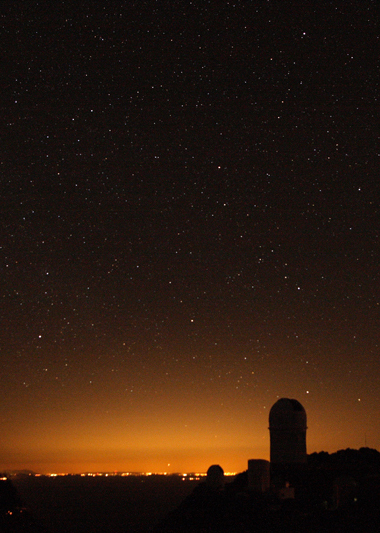 The sky glow of Phoenix and Casa Grande as seen from Kitt Peak National Observatory. A dark, star-filled night sky is important for astronomy and related research, but the grandeur of the night sky is much deeper and broader and must remain accessible to anyone. Over the millennia, life on Earth developed with a day/night cycle. It is ingrained in our natures, and destroying it by turning night into day stresses our systems, including our immune system. This circadian rhythm, with its need for both light and dark, is required for the health of humans, animals, and plants. Are we Losing the Dark? This 6-minute video introduces the issues involved in our rapidly changing ability to see a dark night sky. Our natural environment can and does relax us, but poor nighttime lighting can be a definite psychosocial stressor, similar to noise. Our systems need a break, a better ambiance in life—indeed, better outdoor lighting. It is not hard to do; the technology exists. Local governments can foster good outdoor lighting practices with appropriate codes and ordinances. Flagstaff adopted the first outdoor lighting ordinance in 1958. Tucson/Pima County did so in the early 1970s. The State of Arizona, all counties, and many municipalities now have some form of regulation. These have made a substantial difference. Most of these measures, however, need to be updated to provide effective dark sky preservation in the 21st century. 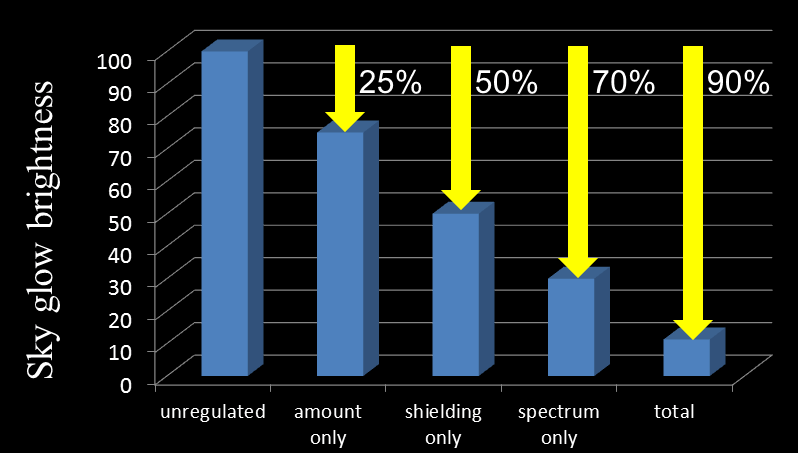 Rapid population growth and changes in lighting technology, especially light emitting diodes, call for updated ordinances and better enforcement. It is critical to address this problem now. The International Dark-Sky Association is a non-profit 501(c)(3) organization that works to protect the night skies for present and future generations. Their website has information on outdoor lighting, conservation, and dark sky parks. Although astronomers and astronomy are important, protecting the night sky just for astronomers would be like protecting Grand Canyon just for geologists. 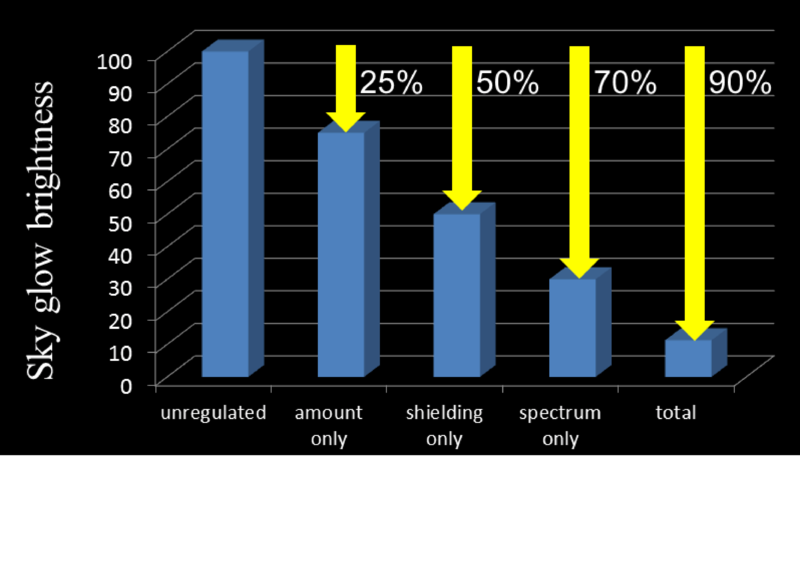 As you read the chart from left to right, notice how Code Standards, working in combination, greatly reduce sky glow brightness. Click here for a comprehensive overview of safe lighting practices and lighting code information. Our place at the forefront of astronomical research is being threatened by the potential loss of the vital dark night skies. Artificial light at night being wasted upward overwhelms the faint light of stars and undermines the value of research sites. Additionally, poor lighting design threatens astronomy and wastes energy. *The good news is that it costs less to correct these practices than to continue them. A lighting code requires fully-shielded lighting fixtures that put light on target, on the ground and sets a lighting budget to encourage efficient design. These codes are proven in practice and meet all professional lighting standards. Using proper shielding keeps light where it’s needed — lighting the ground and surrounding area — rather than wasting light by shining it sideways or up. *The City of Calgary replaced 30,000 residential streetlights with shielded lighting that met Dark Skies Initiative standards, allowing them to reduce the bulb wattage from 200 to 150 W. The result? They saved over $2 million annually and reduced carbon dioxide emission by 16,000 tons per year.